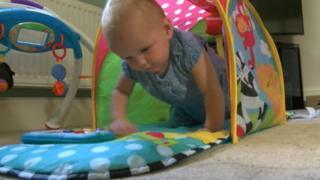 A baby girl was referred to social workers after a doctor incorrectly reported a birthmark as bruising, the child's parents have said. Hannah Langthorne said concerns were raised about a mark on her daughter despite a similar mark being identified as a Mongolian blue spot. She now wants their names taken off Lincolnshire children service records. A council spokesman said the family were not on a child protection register but it had kept a record of events. Children's social care were alerted by a health visitor after two marks were found on Irah Langthorne, who was born in December. The first was identified as a Mongolian blue spot birthmark, but a second doctor said the other mark was a bruise. Mrs Langthorne, from Theddlethorpe, Lincolnshire, claimed the family is now on file as having been investigated for abuse or neglect. She said: "We've asked the doctors and health visitors to remove it [the record] and everybody says they can't, or won't." Janice Spencer, Assistant Director of Children's Services said: "We appreciate this has been a difficult time for the parents and would be happy to meet with them further. "The health and safety of children is the most important thing in the support we give and the county council takes its safeguarding duties very seriously. "We would always seek a medical opinion in the case of identifying Mongolian blue spot." Jeremy Jolley, a lecturer in paediatric nursing, said: "[Mongolian blue spot] has a certain notoriety in terms of its propensity to be confused with a bruise."